Hello, New Year. I see you — all blank and spacious and full of promise. You make me look so good. But, let’s be honest. I’ve promised my way through so many of you that I don’t trust this feeling anymore. My staying power rarely matches the initial fervor of my intentions, and I end up looking like crap. Only, here I am, feeling that same fervor, wanting to make those promises again. And, here I am with this seasoned feeling of distrust. What to do? After sitting with it for a couple weeks, a sweet ritual has come to me: “The Rose and the Rock.” Today, New Year’s Day, I will choose a Rose to bring to my house. 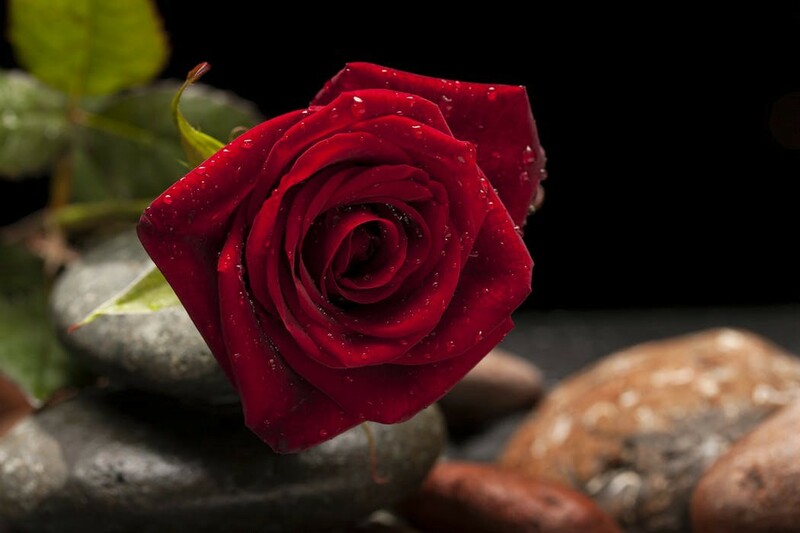 I will appreciate the beauty of this rose. And I know for certain it will die soon, no matter how well I care for it. This rose represents the feelings I have, as I make my promises regarding the New Year. The temptation is to discount these feelings because they fade. But I know better now. These feelings are important. They are like a match to kindling; a crucial component to any commitment. Without it, I’ll never make it to the next step. Which is the Rock. I have a collection of small white rocks, and a black permanent marker. With a measured mind and a tender heart, I will choose a few promises for this year. Each promise will live in its own rock. For instance, I want to have completed the first three chapters of a book I’m writing by March 30th, so on one rock I will write “Book.” And for the daily yoga practice I want to reestablish, I will write “Yoga” on another rock. These rocks represent what I will do regardless of how I feel about it in the moment. They represent what I will do after the initial fervor has died down and I don’t care anymore like I used to. I will tend to the rose as mindfully as possible while she lasts. And I will keep the rocks in my pocket always. This way, I can honor the fire and air of dedication felt at the beginning of any good endeavor — and I can also honor the water and earth, the mud of discipline required to bring any good endeavor to fruition. One last note, perhaps the most important: I do plan to fail a little. I plan to execute these promises imperfectly. And I plan to get right back in the game, every time I fumble. All the way to the end. May you all feel the fervor of your new beginnings. And may you develop a tolerance for tedium, so you can manifest all your worthy ends. If you enjoyed this, please let me know by ‘clapping’ or maybe even commenting. I am a writer, yoga teacher, and founder of the Long Island Dharmata Sangha in Floral Park, New York. Check me out at www.tinalearyoga.com. I love to quilt, to laugh, to read, to take pictures. I love the world that children roam around in. I’m learning, little by little, to be still. To listen better. To slow down. May you all be well and happy. Writer. Yoga teacher. Musician. Buddhist. Quilter. Animal lover. Visible grownup. Hidden child. Secret dancer when all alone. Makes good bread.